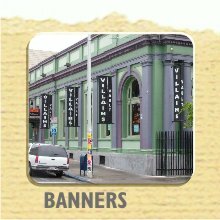 Maybe you need a temporary banner for a specific event, or long term banners to last several years We've got them! You can get an instant estimate for full color banners or contact us for a quote on vinyl cut or canvas banners. Send us your own artwork, or have us design a banner for you.